iPhone 6 Release Date: Set for September? The iPhone 6 release date is tied to traditional iPhone nomenclature and the personal decision of the Apple Corporation to either change the nomenclature or stick with it. The labeling system for iPhones never takes place without an “S” iteration of some sort. With the 3G, there was the iPhone 3GS; the 3GS brought the iPhone 4, which later brought the iPhone 4S. Since the iPhone 5 is the current device on the market, it stands to reason that the next-generation iPhone will be called the iPhone 5S. This is a common assumption of many tech enthusiasts and consumers who cannot wait to get the iconic smartphone in their grasp. However, the nomenclature for the new iPhone is debatable. While some believe the phone will be called the “iPhone 5S,” others believe Apple could label the new iPhone the “iPhone 6.” Who is right? And when is the iPhone 6 release date? The answer to this question depends on a few factors surrounding the iPhone 5S and iPhone 6. Vodafone hints at a coming iPhone 6 release date this September. Does Vodafone know something we don’t? The iPhone 5S and the iPhone 6 Release Date: The Way of the iPad 4? Earlier this Spring, Tim Cook said in Apple’s Q1 earnings press announcement that there will be “amazing new hardware, software, and services that we can’t wait to introduce this fall and throughout 2014.” For many, this indicates that the iPhone 5S release date will not occur until Fall 2013 and the iPhone 6 release date will not occur until Spring or Summer 2014. However, I think that the iPhone 6 release date will occur sooner than tech enthusiasts believe. Remember when the iPad 4 was released? It was released only six months after the Retina iPad 3, upsetting many iPad owners who had just purchased their new iPad some six months earlier. In March 2013, the time in which the new iPad was to debut, Apple changed things up a bit: rather than release the iPad 5, Apple decided to maintain the specs of the iPad 4 (processor, size, screen resolution, etc.) while increasing the internal memory storage only — from the usual 16GB, 32GB, and 64GB versions. Apple added a new storage version for consumers, the 128GB iPad that costs $799 for the WiFi only version and $929 for the WiFi + Cellular version. If no new products are arriving until this Fall, does this necessarily imply that the iPhone 6 release date will supplant the iPhone 5S release date? Not at all; if Apple takes cues from its recent iPad release in March as to a new iPhone release, the iPhone 5S release date could come this summer — with all the same specs of the iPhone 5 but an updated internal memory storage. 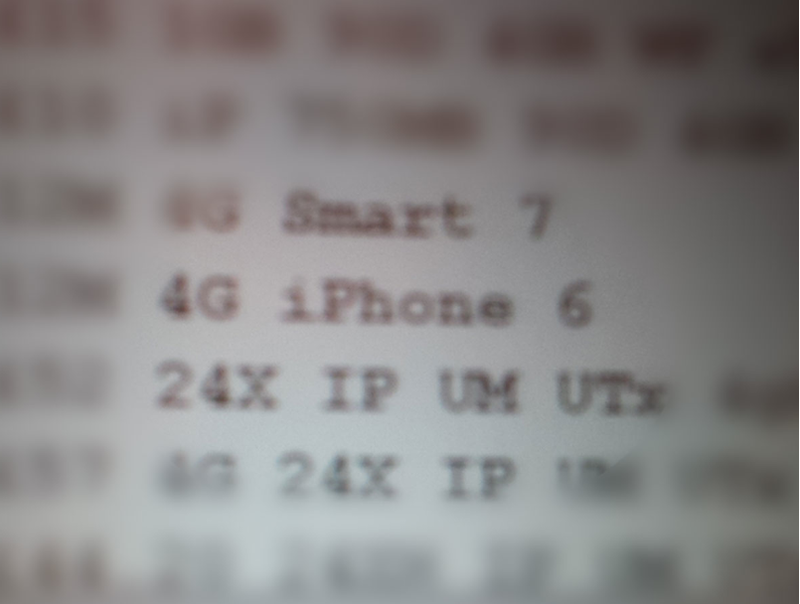 That is, the iPhone 5S could come with 128GB of storage, running iOS7. The real prize phone of the year could be the iPhone 6 with a September release date. A curious photo taken two weeks ago at a Vodafone UK retail store shows a phone inventory log with a 4G iPhone 6 in the center of the phone log. This was interpreted at the time as a carrier “guesstimate”, though I think it’s more than that. The current iPhone 5 will not work with Vodafone’s network currently, and the next iPhone looks to be compatible with Vodafone’s network. Vodafone UK is anticipating the next iPhone in its inventory. However, if my working theory is right about the iPhone 5S being nothing more than a bumped-up internal memory storage version of the iPhone 5, then Vodafone UK is right on the money about the iPhone 6 release date. The iPhone 5S would be as incompatible on Vodafone’s network as the current iPhone 5 — and would not be available for Vodafone’s consumer base. If none of the above convinces you of the iPhone 6 release date, what about the small time frame between now and September? After all, if all the new stuff will emerge this fall, why spend the money and time to produce an iPhone 5S with completely-revamped specs, possibly a smaller frame, and/or a a wider display? Four months lie between where Apple is now and Apple’s intended Fall announcements. Consider how many engineers have had to abandon Mac OS X in order to work on iOS7? It was said some weeks ago that Apple was somewhat behind on its mobile OS; later, it was reported that Cupertino would be ready for prime time and that iOS7 would arrive as scheduled. If the company postponed a new iPad in the Spring but released a new memory version, why would Apple do anything different with the iPhone 6? And if the company has been behind in producing iOS7, how would it have the resources to produce iOS7 while working on a newly-engineered iPhone simultaneously? It makes better sense economically to pool all one’s financial resources into four months from now, rather than strain one’s finances to produce a bumped-up iPhone 5S now. Many iPhone users will most likely put off a summer purchase for the iPhone 6 release date in September. It seems that Apple still wants its “Christmas parade” to be the highlight of the year. I think that, if a fingerprint scanner comes to the iPhone, the September iPhone 6 release date is the “ruby slipper” Apple has in mind.